Every season Rodarte delivers a bit of a surprise. However, for autumn winter 2014 they presented a look that was so unexpected there were audible gasps in the crowd. 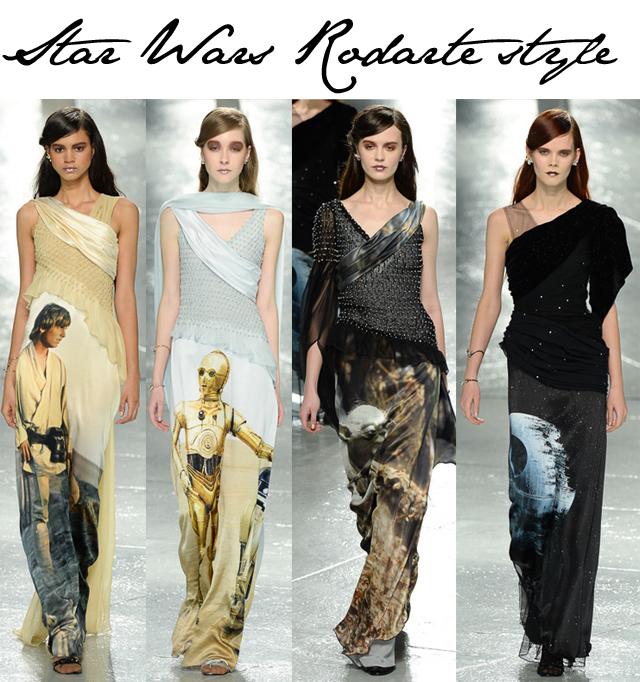 Rodarte brought back Star Wars. We're talking Luke Skywalker, C3PO and Yoda, in print and on the dresses. Evening gowns featured the film stars on the long and floaty skirts. Watching Yoda float down the catwalk was a sight we never believed we'd see, but there it was in full colour on a model, on a catwalk for Rodarte. We're sure many in the audience believed it was lack of sleep causing such hallucinations. This is the real deal people and our next logical question is who will wear it first? Surely someone will be brave enough to request one for the red carpet at the Oscars. That would be a moment, wouldn't it? The next question is... how on earth did they get permission to make this happen? !